Taking a decent product photo is always a challenge for me. My photos got much better after finding a web site called Table Top Studios. They specialize in selling equipment for product photos and are a wonderful resource if you call them. One 10 minute phone call paid immediate dividends. I am still a hack but...much improved. They are based in Santa Barbara California so I may have to drive over there one of these weekends for some hands on training. Here is a stock photo of the set-up I bought although they have many other options. (11-14-2013, 06:58 PM)freddy Wrote: Nice setup, Phil. They even have some table top studios with a turntable. You can then take the same picture from several angles and put a rotating picture up on your website or ebay. Pretty cool. Wow, Phil! You are much more advanced than I!! I still don't have a light-box, and I have never used Photoshop before! 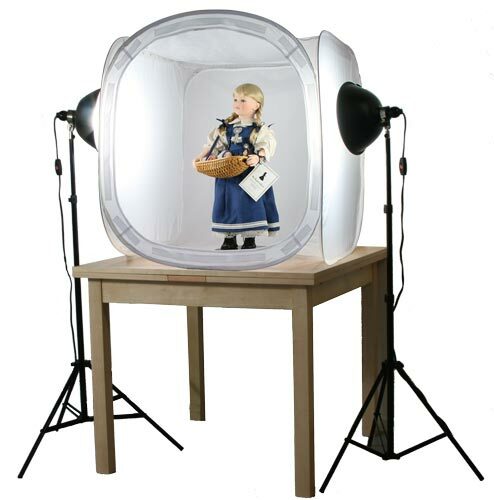 I just ordered an additional background and a Kuhl light pad for under lighting. I am looking forward to seeing how it works with aftershave bottles and razors. I will likely pick up a boom light next. I would love to but I am having them ship the equipment. It should really help with aftershaves and colognes. I am also curious to see how it will work for razors. The boom light will also help but I will wait a bit before I get it. Money very well spent IMHO. (01-07-2014, 08:57 PM)Nickadermis Wrote: Money very well spent IMHO. Thank you. I am really looking forward to it so I can play around a bit. Hopefully I can get some good product shots of all the aftershaves/colognes. It should be keen on translucent objects like cologne bottles ! I'm excited to see your results ! Congratulations, Phil and looking forward to the new pics! Phil, I, too, am looking forward to the new photographs. Bet they'll look terrific. Congratulations. Does anyone know if the lights presented in this thread are compatible with daylight-balanced film?